This 71 year old man had a history starting in 2013 of a biopsy of the right hand with a diagnosis of basal cell carcinoma with osteosarcomatous transformation. 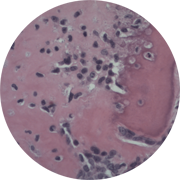 In 2014 the patient underwent right axillary lymph node dissection which showed metastatic sarcomatoid carcinoma in three of seventeen lymph nodes. In 2016 the patient developed a soft tissue mass in his right upper extremity which demonstrated sarcoma with myxoid and cartilaginous features. This was though metastatic from his original site on his right hand. Sarcomatoid carcinoma or carcinosarcoma of the skin is rare. Basal cell carcinoma (BCC) with osteosarcomatous differentiation is the second most common sarcomatoid carcinoma of the skin, following squamous cell carcinoma with heterologous mesenchymal differentiation. There are only 11 cases of BCC with osteosarcomatous component reported in the literature, with limited documented molecular analyses.